In the field of construction diagnostics and litigation, water testing is frequently used to find the source of water intrusion, and less frequently, to proof test prototypical repairs. Selecting the type of test and conducting it properly is important, not only so that it will be an effective diagnostic tool, but also so that it will be credible if presented in court in conjunction with expert testimony. Even among experienced professionals, the type of testing most frequently used is a garden hose with an adjustable nozzle, operated in a manner dictated by the immediate objective of producing or replicating a leak. The water pressure, spray pattern, distance from target, angle of attack, and time of exposure are determined in the field to suit local conditions. While this may be effective as a diagnostic exercise, it has the disadvantage of potential criticism for a lack of objectivity; that is, producing results that do not replicate expected environmental conditions. An example would be the production of a test leak by pointing a nozzle at a void up under a soffit that would normally not be subject to wind-blown rain. To counter criticism involving objectivity as well as to provide reliable results, test procedures sanctioned by established industry associations and standards organizations are available. Relatively simple and inexpensive is the Architectural Aluminum Manufacturers Association (AAMA) 501.2, Field Check of Metal Storefronts, Curtain Walls, and Sloped Glazing Systems for Water Leakage (see photo on right). Used for exterior windows, curtain walls, storefronts, sloped glazing systems, doors, and other wall components, this test method is similar in concept to the simple garden hose spray method. It is most effective for joints that are designed to be permanently closed or watertight. Often referred to or described as the Hose Test Method, it involves the use of a calibrated hose nozzle to deliver water to the test specimen at prescribed pressures. The test procedure consists of systematically wetting the test specimen with water from the spray nozzle that is held at a distance of 12 inches from the joint. The nozzle is moved slowly back and forth above the joint covering approximately 5 lineal feet of joint during a 5-minute period. 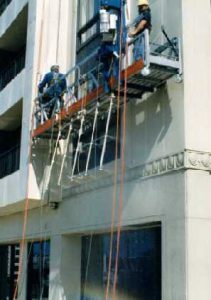 A more sophisticated and more expensive test is described in American Society for Testing and Materials (ASTM) E-1105, Field Determination of Water Penetration of Installed Exterior Windows, Curtain Walls and Doors by Uniform or Cyclic Static Air Pressure Difference (see photo below). This method is useful for determining the in-place performance of a specimen when subjected to a prescribed rate of wetting under a defined static pressure difference. This method is often referred to as the Chamber Test Method, or differential pressure method, because it requires that a test chamber be installed either on the exterior or interior side of the test area. The test procedure consists of delivering water to the exterior from a calibrated spray rack at a minimum rate of 5gal/ft2/hr while simultaneously applying a specified differential pressure across the specimen. The test can be performed for a duration of 15 minutes of static pressure or in a cyclic procedure in which the differential pressure is applied for 5-minute durations with 1-minute interruptions of no differential pressure and only water spray. Includes the effects of load deformation on system components. A third simple test is described as an “optional test” under AAMA 502, where water introduced into the sill section of a window assembly with the weep holes plugged. 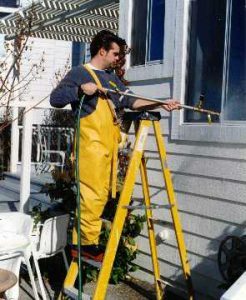 If the water level is observed to drop over a period of time, it indicates that there may be a leak at a jamb-sill joint. Typically, finishes have to b removed to confirm internal leakage of this type. A thorough analysis of the project objectives should be made as a part of the selection of the appropriate test method.